Wall cladding is a budget-friendly option that can suit any bathroom. It is also an effective method of waterproofing the walls and making them look great at the same time. However, with a large variety of styles and materials available these days it can often be difficult to choose the right one for your home. Previously, wall cladding was made using plastic, but with time it is now available in various materials as well. The best part of cladding is that it is inexpensive and also easy to install and maintain. The wide range of options available opens up an entire world of bathroom wall cladding ideas so that you can turn your imagination into a reality. Here is a list of 10 ideas that you must consider before styling your bathroom. 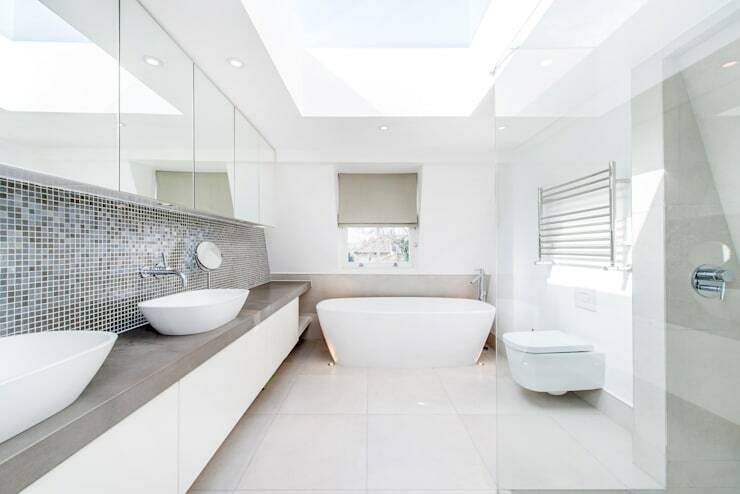 Looking at this picture will make you fall in love with the modern appeal of this bathroom. The design focuses on the overall wooden finish that also gives it a beautiful appearance. Whether it is the base of the shower, the floor under the sink, or the wall cladding, it all looks perfectly harmonious. The slate gray colour combination used in the room also makes it feel contemporary. The cladding used on to the wall is somewhat uneven which gives it a textured look. Cladding as a material has evolved drastically over the years. 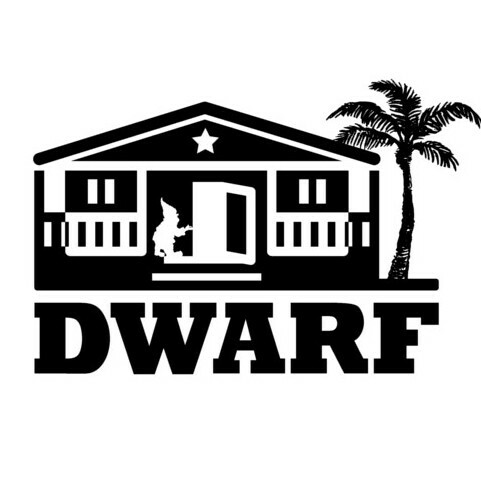 One can now make it look like anything they want almost instantly. 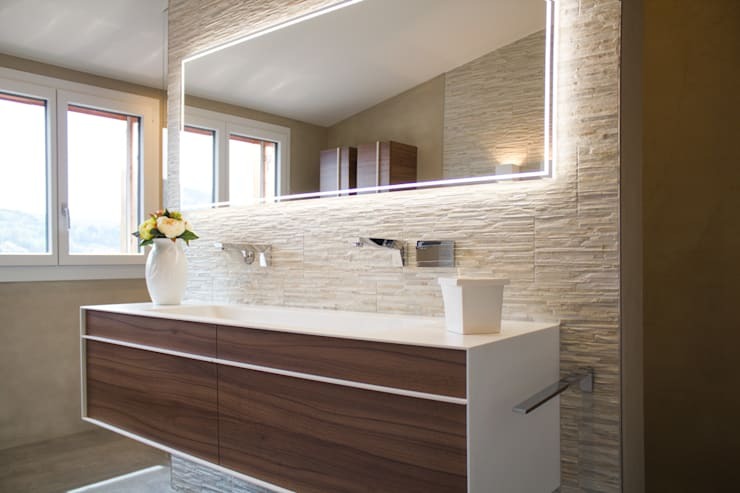 The wall cladding used in this bathroom gives it a stone like finish which makes the surface look stripped and natural. The light colour walls and the darker wood vanity also makes for a perfect combination. This dual tone combination helps each element stand out individually. 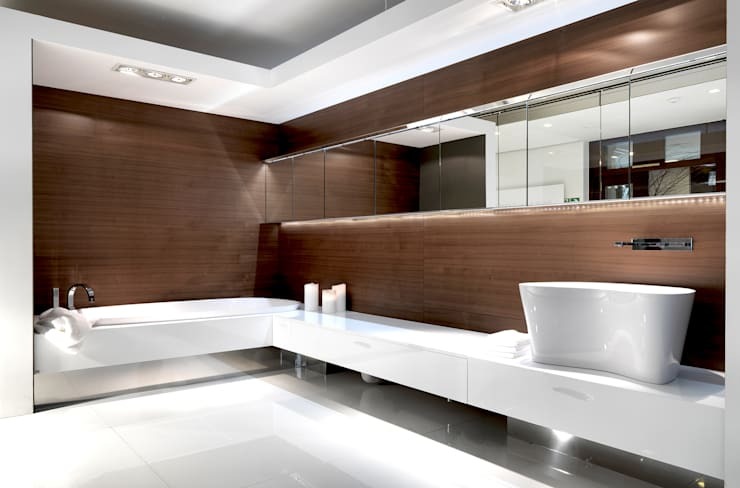 If you want a wooden finish in your bathroom without using actual wood, then cladding can make it possible. The best part about using cladding is that it covers every surface any unites the whole bathroom from top to bottom. 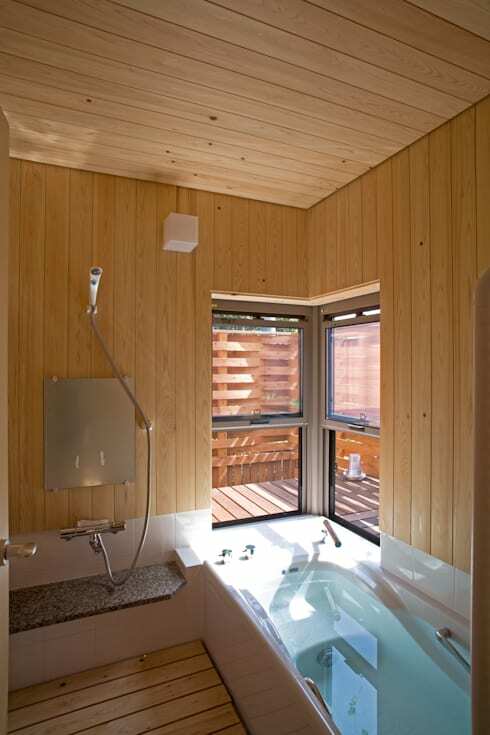 Wooden cladding ideas like these can give your bathroom a warm appeal similar to the original material. Unlike real wood, the cladding is waterproof, easy to clean and install. 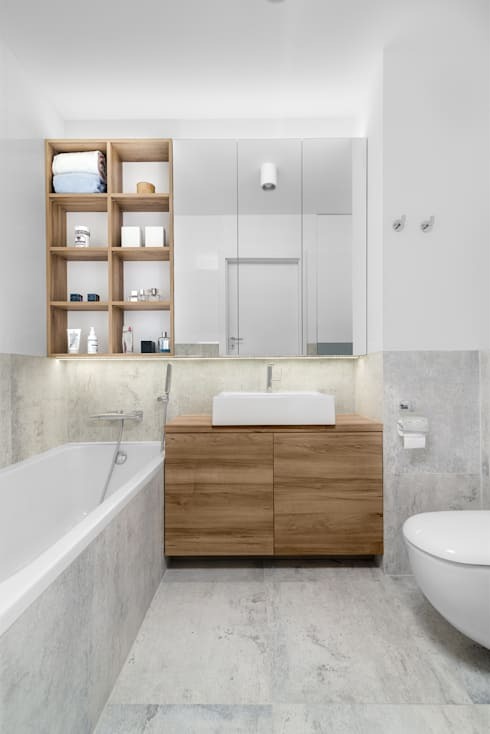 A bathroom that uses a minimalistic design approach and natural wood cladding always look beautiful. The addition on the wall by Jo Downs gives it a much-needed touch of colour. These fishes are made using fused glass and can be added to any cladding. 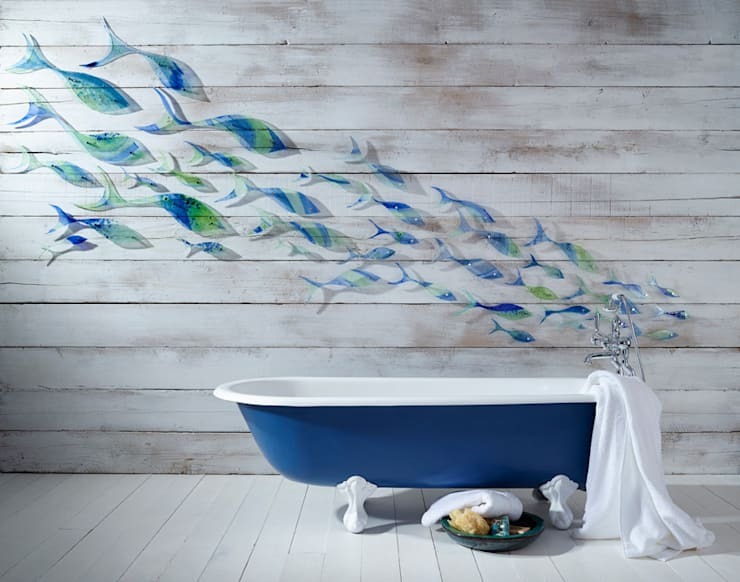 In this case, the designer has used a washed-out white surface to integrate the blue fishes, which also complements the colour of the bath tub. The bathroom in this picture resembles a sauna which also makes it look comfortable and cozy. Although this room isn't your typical bathroom, the cladding makes it look exactly like one. The windows and ceiling of this room have been placed lower than usual. However, the vertical approach used in this case gives it an illusion of height. 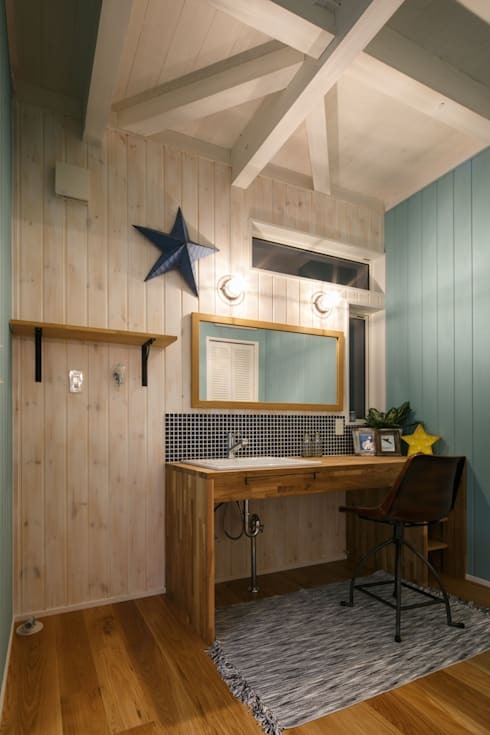 By using cladding for this bathroom, the designer was able to make it look like a beach hut. Although this room has been whitewashed, we can still see the natural colour of the wood peeking through. The use of blue on one of the walls also helps the overall appearance to look like a beach theme bathroom. 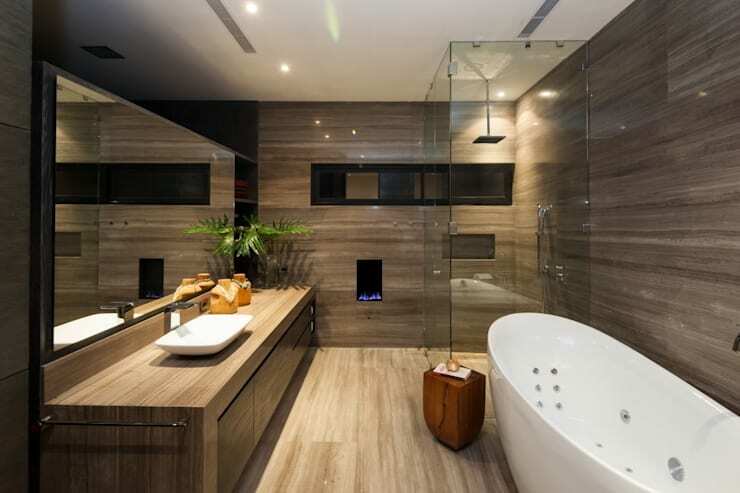 This bathroom is the perfect example of contemporary design. Every little part of the design has been thought through whether it is the mirrors or all the fixtures below the cladding. The combination of the dark brown walls and the stark white accessories also help to break the space visually. 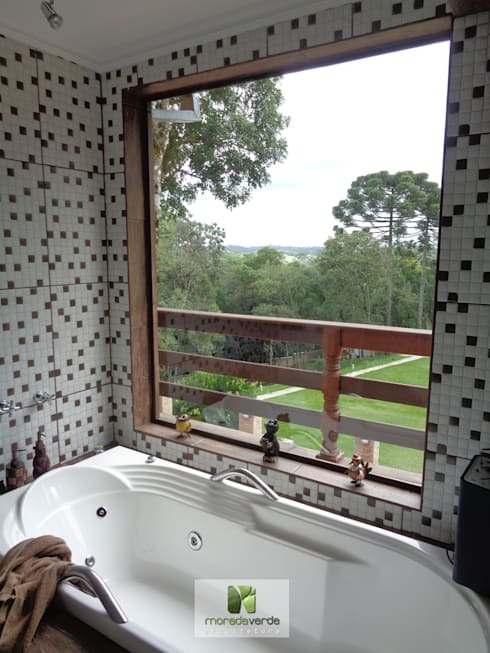 Similar cladding for bathrooms can also give it a more natural and timber like feel. Every point covered by this ideabook showcases cladding beautifully. In this option, we highlight how bathroom cladding can have the appearance of tiles. Due to the modern technology, it is now possible to achieve cladding style which is similar to a mosaic. The design in this bathroom acts as a focal point and also gives it an element of colour. The unique thing about this mosaic cladding is that it looks real. Marble is a very costly building material. Still, everyone loves the look of it because of its sophisticated and grand appearance. Wall cladding can also offer a marble-like finish that to for a fraction of the price. In this bathroom, we can see that the cladding has covered almost every surface available. Also, the shade of gray used in the cladding makes it look even more realistic and elegant. The cladding, in general, is a smooth building material. But if you are looking for patterns or textures on the wall then that too can be achieved. The cladding used within this bathroom not only gives it a beautiful look but also makes the whole room come to life. This option can also be used as an alternative to the colorful mosaic tile design seen above.